The port of Galveston remains closed due to Hurricane Harvey. Carnival has two ship which were scheduled to turnaround at Galveston on Saturday, Carnival Freedom and Carnival Valor. Carnival announced this afternoon that those two ships will remain out of the storm's way and await Galveston's reopening. Back in June, two Indonesian crew members went ashore from Carnival Fantasy in Mobile on a turnaround day, and as happens occasionally, they didn't return. At about the same time, the same thing happened with another crew member from Indonesia who worked aboard Carnival Ecstasy from Charleston. Carnival reported each of them to the Customs and Border Protection folks when they did not return to their ships. After crossing the Yucatan, Hurricane Harvey has once again regained hurricane strength and is headed toward the Texas coast, expected to arrive late Friday and early Saturday. The port to watch is Galveston, farther up the coast to the north from where it looks like the eye will come ashore. Still, the Galveston area is expected to be affected. No, that wasn’t an Annette Funicello movie you missed in the '60's. Royal Caribbean is doing some work at Adrenaline Beach in Labadee, their private beach resort on Haiti and they will be using more reef balls there. 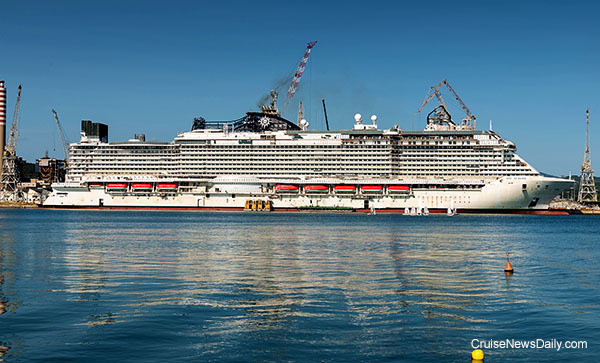 MSC Seaview was floated today for the first time at Fincantieri’s Monfalcone yard. The 154,000-ton ship is the second in the Seaside-class. The class is designed to bring passengers closer to the sea with the experience focused on sun and sea. 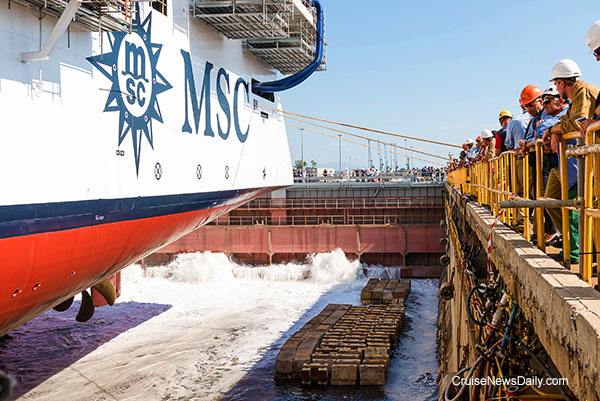 Photos of MSC Seaview taken at today's float out are below. Water begins to flow into the dry dock for the first time. 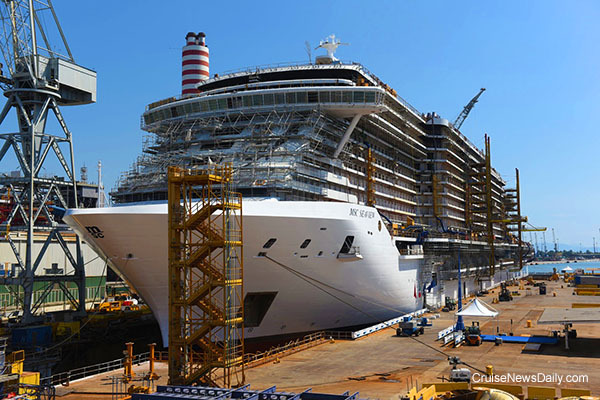 Photos are courtesy of Fincantieri and MSC. All rights reserved. They may not be copied or used without express permission. The man accused of murdering his wife aboard Emerald Princess pleading not guilty. The US Department of State today issued a new Travel Advisory for US Citizens going to Mexico. Two places they have stepped up the cautions are in Baja California Sur (including the cities of Los Cabos and La Paz) and Quintana Roo (including Cancun, Cozumel, Playa del Carmen, Riviera Maya, and Tulum). If you are the type who thinks of breakfast as a Danish and a cup of coffee and juice, and maybe for a treat, a little bacon, Azamara has something interesting for you. Celebrity Cruises has partnered with the Regional Maritime University (RMU) in Ghana. As a result, Celebrity will become the first in the industry to openly recruit female bridge officers from a West African country. Bahamas Paradise Line inked a deal with the Port of Palm Beach to add a second ship homeported there, and the ship will be the former Costa neoClassica, renamed Grand Classica. As Britain’s main cruise port, Southampton is always busy, but the port warned those in Southampton and those coming into the city that Saturday and Sunday were going to be extra busy, because ten cruise ships were scheduled to be in port over the two-day period. Royal Caribbean kind of got out ahead of everyone else with this week’s sailing of Oasis of the Seas. Early on they sold it as a cruise to see the eclipse of the sun and made it a point to have the ship in the path of the total eclipse and (thanks to their own meteorologist) have that place along the path be under clear skies - a definite advantage of viewing from a cruise ship. Bonnie Tyler and DNCE perform “Total Eclipse of the Heart” on route to the Total Eclipse onboard Royal Caribbean's Oasis of the Seas. Video provided by Royal Caribbean.